​Liverpool moved to the top of the Premier League table with a hard-fought 2-1 win over Fulham on Sunday afternoon. It took some time for Liverpool to get going, but they were able to take the lead after 25 minutes through the in-from Sadio Mane. The Senegalese winger played a sharp one-two with Roberto Firmino before stroking the ball home from close range. 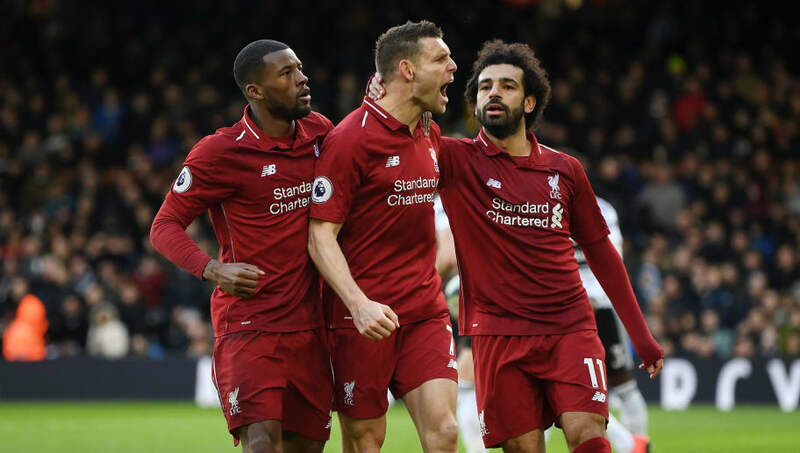 The Reds maintained their one goal lead into the second-half, but struggled to find a second and were soon put under increasing pressure from a resurgent Fulham side. That pressure soon told and Fulham found a well-deserved equaliser through former Liverpool man Ryan Babel following a defensive mix-up between Virgil van Dijk and Alisson. Just when it looked as though Fulham would be able to pull off a major shock, Liverpool restored their lead from the penalty spot through James Milner. Sergio Rico foolishly brought down Mane in the box and Milner made no mistakes from 12 yards. That proved to be the last action of the game, with the Reds holding on to a crucial three points. Check out the full breakdown of the game below. ​Fulh​am's chances of avoiding relegation are virtually non-existent, but the Cottagers will still want to finish the season strongly and restore some much-needed pride. There have been some signs of improvement under interim manager Scott Parker in recent weeks and they deserve a huge amount of credit for the way they fought back in the second-half of this one. They didn't lose their heads after going a goal behind and stuck to their game plan diligently, taking full advantage of Liverpool's lack of intensity. It's clear that Scott Parker has had an impact since he took over the reigns at Craven Cottage, so it would seem harsh for him not to be given the job on a full-time basis. But, given how chaotic things have been behind the scenes for Fulham, anything could happen this summer. Starting XI: Rico (4); Fosu-Mensah (5), Ream (6), Chambers (6), Bryan (7); Seri (6), Anguissa (5), Cairney (6); Ayite (5), Babel (7), Mitrovic (6). Substitutes: Sessegnon (5), Christie (5), Kebano (N/A). Bryan hasn't been overly convincing during his debut Premier League campaign, but the former Bristol City left-back put in a impressive shift to nullify the potential threat of Mohammed Salah and Trent Alexander-Arnold. He has faced plenty of criticism for switching off at crucial times this season, but if he can keep up this sort of form between now and the end of the season then there is every chance another top flight side will be expressing an interest in the summer. Great to see @joebryan run rings round Salah just now #FULHAMFC #FULLIV! Go Joe! Joe Bryan is a baller. ​Liverpool would have understandably been full of confidence heading into this one after they performed superbly to dispatch Bayern Munich in the Champions League in midweek. However, they were far from convincing this time around and were somewhat fortunate to come away with all three points. After going ahead midway through the first-half, their passing became lethargic and they made far too many poor decisions in the final third, making things too easy for the Fulham defence in the process. The performance certainly wouldn't have pleased Jurgen Klopp, but at this stage of the season nothing is more important than picking up victories - no matter how you do it. Starting XI: Alisson (6); Alexander-Arnold (6), Van Dijk (6), Matip (6), Robertson (6); Fabinho (6), Wijnaldum (6), Lallana (6); Salah (5), Mane (7), Firmino (6). Substitutes: Milner (6), Origi (6), Sturridge (N/A). There's no denying it now. ​Mane is the main man for Liverpool. With Salah continuing to misfire in front of goal, Liverpool have had to rely on Mane to provide the goals in recent weeks and he has been all too happy to oblige. He bagged another goal in this one and was on his toes to capitalise on Rico's mistake for the winning penalty. It's not too crazy to suggest that he has every chance of finishing the season, not only as Liverpool's top scorer, but also as the league's top scorer. Sadio Mané is currently the best player in the Premier League. The international break brings a temporary halt to proceedings for both sides next weekend and they'll return to Premier League action at the end of the month. Fulham host Manchester City on the 30th March, whilst Liverpool welcome Tottenham to Anfield on the 31st March.